I always find it enlightening when I go looking for information to give you about topics on which I choose to write. Without exception I always learn something. This is no less true with today’s foraging plant, red clover. You’re probably familiar with some variety of it. There are seven scattered throughout the northern hemisphere. 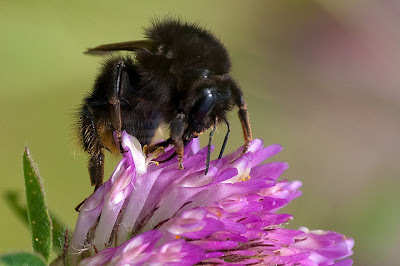 If so most likely you remember being a small child and plucking the individual florets and sucking out the nectar. The taste is spicy sweet. But there’s more to this plant than meets the eye. It has medicinal as well as culinary uses, and because of that there’s the inevitable potential side effects of which I must responsibly make you aware. It’s only for concentrations of red clover, but so be it. Medicinal uses are outlined below. Trifolium pratense (red clover) is a species of clover, native to Europe, Western Asia and northwest Africa, but planted and naturalized in many other regions. It is an herbaceous, short-lived perennial plant, variable in size, growing to 20–80 cm tall. The leaves are alternate, trifoliate (with three leaflets), each leaflet 15–30 mm long and 8–15 mm broad, green with a characteristic pale crescent in the outer half of the leaf; the petiole is 1–4 cm long, with two basal stipules. The flowers are dark pink with a paler base, 12–15 mm long, produced in a dense inflorescence. The main chemical components of red clover are phenolic glycosides (salicylic acid), essential oil (methyl salicylate), sitosterol, genistiene, flavonoids, salicylates, coumarins, cyanogenic glycosides, silica, choline, and lecithin. Red clover also contains vitamin A, vitamin C, B-complex, calcium, chromium, iron, and magnesium. 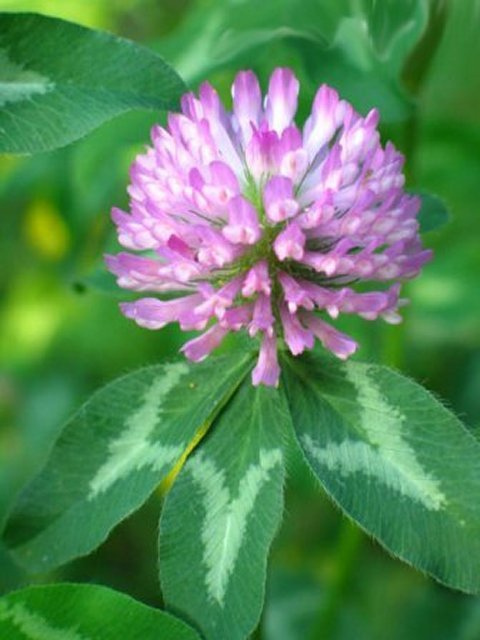 Red clover has been used medicinally to treat a number of conditions. Traditionally, these have included cancer, whooping cough, respiratory problems, and skin inflammations, such as psoriasis and eczema. Red clover was thought to "purify" the blood by acting as a diuretic and expectorant, improving circulation, and helping cleanse the liver. Modern scientific tests have shown that red clover contains isoflavones, plant-based chemicals that produce estrogen-like effects in the body. Isoflavones have shown potential in the treatment of a number of conditions associated with menopause, such as hot flashes, cardiovascular health, and osteoporosis. However, as researchers have become aware of the side effects of taking estrogen, there is also some concern about the safety of isoflavones. And the evidence that red clover helps reduce any menopausal symptoms – like hot flashes – is mixed. Side effects with red clover are generally mild and rare. They include breast tenderness, menstruation changes and weight gain. Red clover extracts have theoretically been associated with interactions with blood thinning agents (e.g. warfarin and hormonal therapies) but this has not been confirmed with actual case reports. Although there is no evidence for concern, it is advised that red clover extracts should be avoided in women with a history of breast cancer. Pregnant and breast feeding women should not take red clover. Red clover ice cream in progress. There are many forms of red clover. These aren't specifically ours in Nova Scotia but ours can be used. To gain any of the benefits or worrisome effects of red clover you would have to ingest an awful lot of the blossoms. All the medical information pertains to extracts or concentrations, so you’re safe using it to cook. For example, clover honey is sold in grocery stores and there’s no health warnings blasted on the side of it. Clover blossoms can be brewed as tea, made into ice cream, tossed into salads, added to pancakes, biscuits or rice, as well as boiled into syrup that can be used as a sweetener. The seeds can also be sprouted and used much as alfalfa sprouts. These are only a few culinary options. There are many more if you look. So let’s get cooking, shall we? 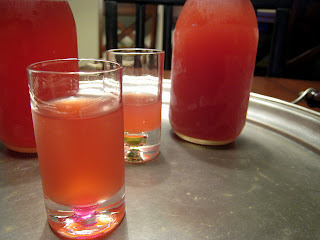 Let’s make summer drinks! If desired use this as a mixer and sneak in a little vodka for an afternoon deck party. If not, just add ice for a refreshing summer drink. Essentially you’re making a clover “tea” which is then flavoured with lemon juice. Simmer the clover blossoms in the water for 10 minutes. Then add the sugar (or honey)and stir it until the sugar is dissolved. 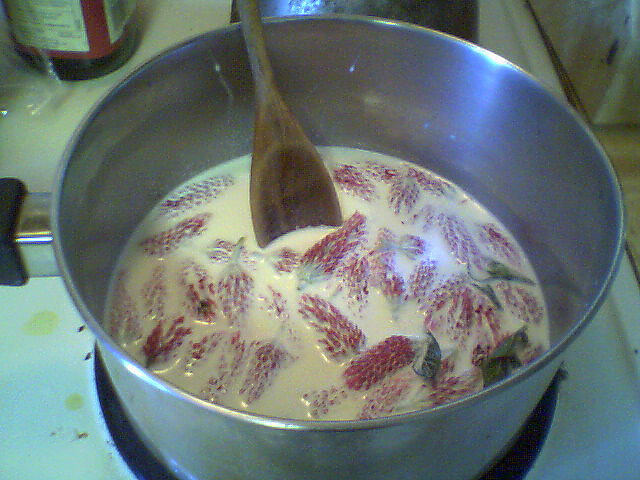 Cover the pot and let it steep for several hours or overnight. 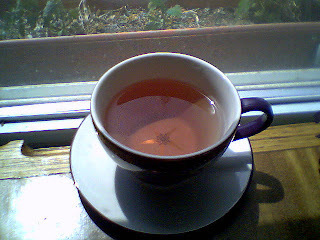 Steeping makes the “tea” stronger. Lastly, add the lemon juice and red food colouring. If your tea is too brown you may want to omit the food colouring. It's up to you. Chill before use. Lemonade is a fantastic refresher on a hot summer day and herbal lemonades are no exception.